Smoky Portuguese Shrimp at The Blue Shrimp Restaurant on the Beach. Sadly, my time here in Puerto Vallarta Mexico is winding down. Last night’s wedding was a huge success. Congratulations to the happy Newlyweds Jacki and Andre. They would have easily won Wedding Wars on TLC. 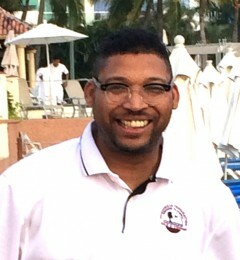 The Catering staff of Casamagna Marriott Resort and Spa, led by Supervisor Carlos, did an amazing job with the food. There wasn’t much from the Grill, but I’ll attach some gratuitous delicious Wedding Food pictures at the end of the article, anyway. The Blue Shrimp owner Martin’ mixes drink at table while nearby Server makes a fresh Caesar Salad table side. 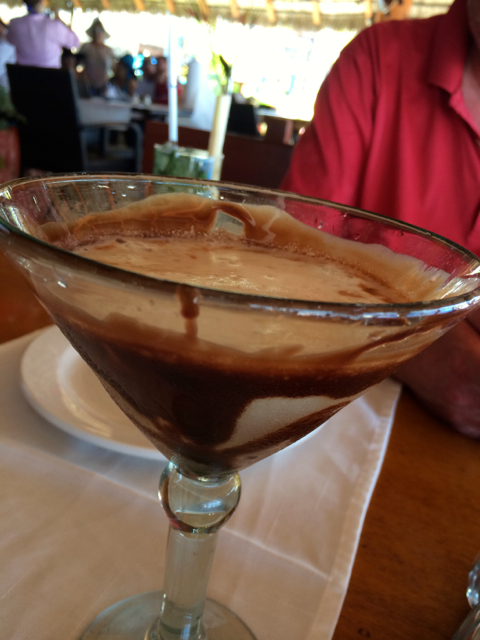 Before I toured the Grills around La Playa De Los Muertos, we stopped for a “snack” at the Blue Shrimp Restaurant. Mission Impossible. The place is popular among tourists for it’s name and excellent location. Though commercial and kitschy, the decor bespeaks of more cleanliness than you’ll find at almost any other restaurant in the area. As a Certified Professional Food Safety Manager, I see the California Department of Health would have a Field Day writing citations on the Beaches of Puerto Vallarta. Coconut Shrimp at The Blue Shrimp Restaurant in Puerto Vallarta. Keeping it real, The Blue Shrimp is the subject of mixed reviews on Trip Advisor. Some people say it is under par and overpriced, while others say it’s the best food ever. As you know, it is always a matter of personal taste and your idea of reasonable value. Trying the dishes, I could see both points of view. The earlier comment about a snack at Blue Shrimp being “Mission Impossible” was regarding the big filling portions of their minimum sized dishes. Maybe it’s my bad, I didn’t realize we were ordering entrees that came with under steamed Rice and Veggies. 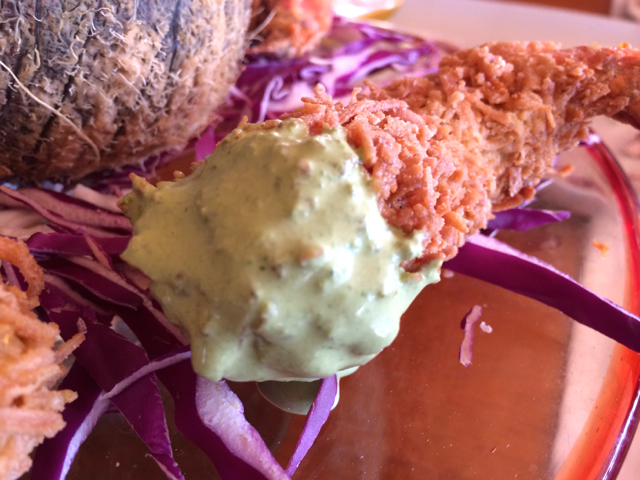 A closer view of the Coconut Shrimp, with Dipping Sauce. “The Good” was the Jumbo Shrimp- 6 per Order- all came out tasting nice and fresh. “The Great” was the presentations. The Bacon wrapped Shrimp was served on a half Mango Plank, with a torch burning for extra drama. 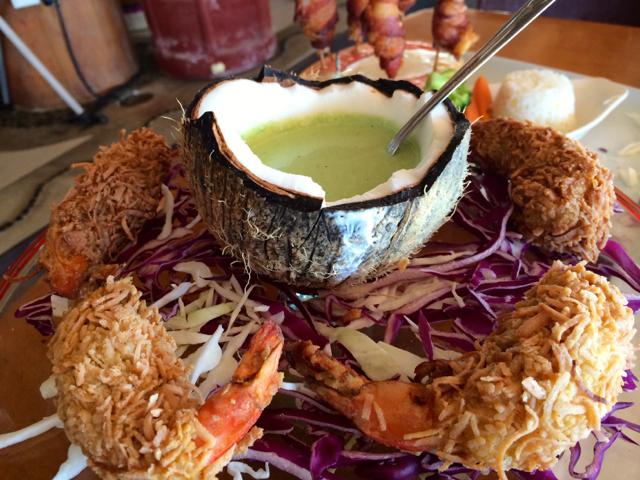 The Coconut Shrimp looked ginormous, plated around a freshly cut Coconut Bowl, filled with Dipping Sauce. So far, so good. The “Not-So-Great” (or Bad) was the breading. I can see how some would have issue with the Coconut Shrimp Batter, which was an inch think on some parts. It is hard to find fault with too much Bacon. But the super thick slices on the Portuguese Shrimp were crispy on the outside and chewy on the inside. The flavor did seem to dominate the fresh Shrimp. 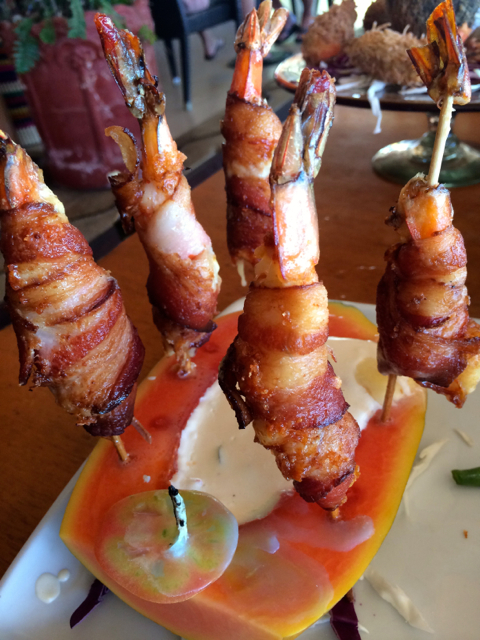 Maybe the dish should of been called “Thick Bacon Wrap with Shrimp”. 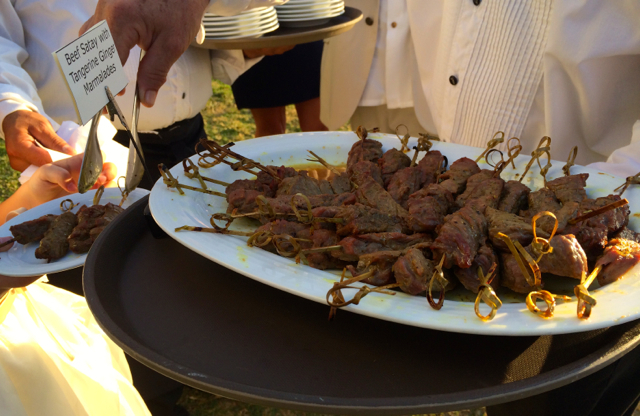 Gratuitous Wedding Food Photos (#1)- Beef Satay with Cucumber Sauce. The one that got away- didn’t get one before it disappeared. With a little bit of food e-arranging, we were able to enjoy the best parts of the Blue Shrimp dishes, and leave the less desirable components on the plates. Still left full and satisfied. 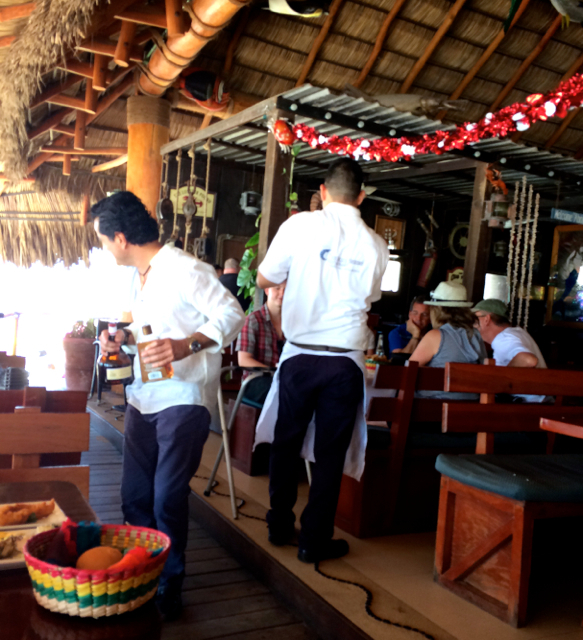 Next time we will do Tour of What’s Grilling on the Beach in Puerto Vallarta. Here are those Weding Food Pics I promised. Until next time- Eat and Be Well. 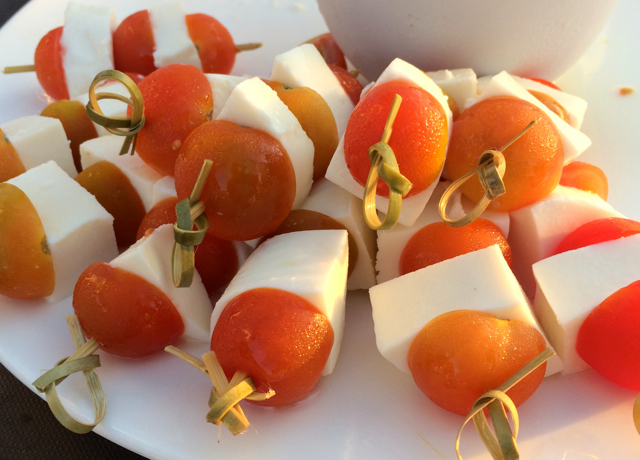 Tomato Mozzarella Skewers were served with fresh Basil Dipping Sauce at the Marriott Casamagna Resort and Spa in Puerto Vallarta, Mexico. 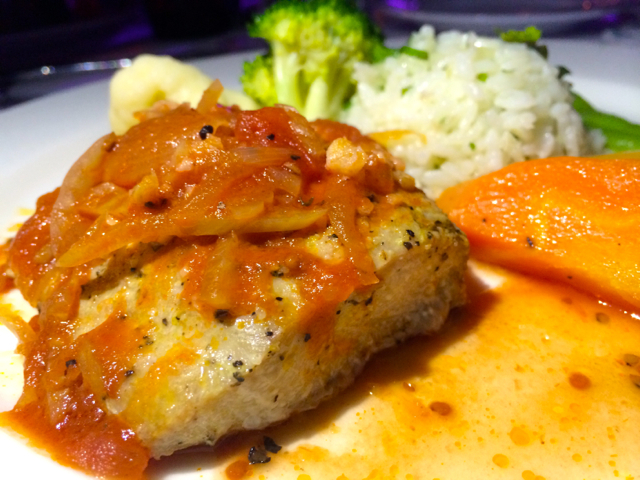 You can see all the great seasoning on this delicious Salmon with Tomato Onion Ragu. 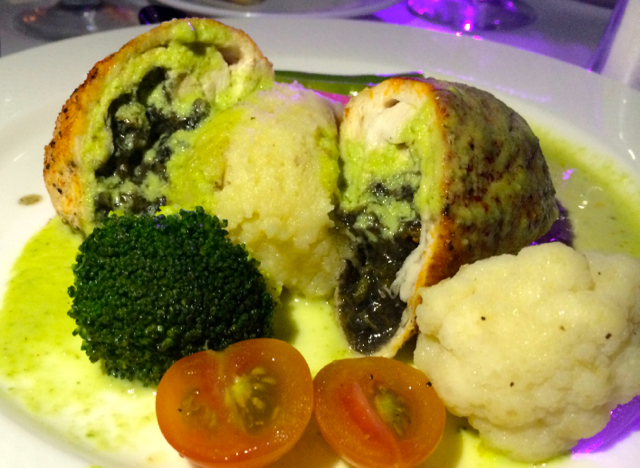 The Artichoke and Spinach Stuffed Chicken Breasts were amazing with a light Basil Sauce.